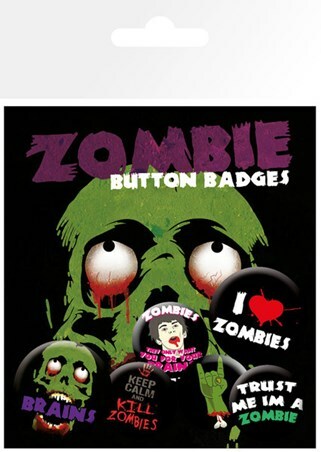 Fantasy Badge Pack: Get ready for the zombie apocalypse with the help of this awesome button badge pack which features six delightfully un-dead designs. Featuring a selection of zombie phrases and pictures, these creatures of the night are hungry for brains as they shuffle from place to place in search of their next meal. So whether you love zombies or you are primed and ready to take them down, this comical badge pack is the perfect addition to your favourite bag. High quality, framed Brains!, I Love Zombies badge pack with a bespoke frame by our custom framing service.